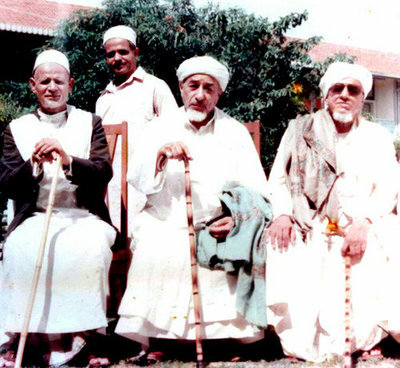 Habib Abdel-Qadir (seated left), Habib Ahmad Mashhur Al Haddad (middle), Habib Abdal Qadir Al Saqqaf (right). Behind them, Sherif Taha Al Haddad. Habib Sharif Abdel-Qadir bin Al-Habib Hassan bin Esmael bin Ali bin Abdel-Qadir Al Hamid was from the famous Ba'Alawi family, leading back to the Prophet Muhammad Peace and blessings be upon him, and was born in 1931 AD or 1350 AH in the town of his ancestors: Aynat, Hadhramaut, South Yemen. He studied Qur'an at the Madrasa of the great Shaykh Abubakr bin Salim (his great-great grandfather) under the guidance of the shaykh of the school, Abdal-Rahman Ba-Ridhwaan, and Habib Abubakr Al-Jifry. His father urged him to travel to the city of scholarship and light – Tarim in Hadhramaut – to study the foundations of the Islamic religion under the direction of the knowledgeable scholar, Al-Habib Abdallah bin Umar Al-Shatry. Habib Sharif Abdel-Qadir also studied the foundations of Arabic grammar under another authority, Al-Habib Hassan bin Abdallah Al-Shatry, and with Shaykh Mahfoudh, one of the resident ulema of Tarim. He became qualified in the science of Islamic Jurisprudence under the tutorship of Shaykh Abdal-Rahman bin Ahmad Ba-Wazir, the Imam of the Mosque of the great Shaykh Abubakr bin Salim, in Aynat, and studied further in Tarim under Al-Habib Abubakr Al-Sarry. Shaykh Muhammad bin Ali Dhakin instilled in him the intricacies of knowledge of Inheritance (Ilm al-Mirath). Shaykh Abubakr Ba-Ridhwan listened to his readings of the book "Siraj Al-Wahhaj"
Al-Habib Abdallah bin Ahmad Al-Haddar also instructed him. Al-Habib Salim bin Hafidh was the teacher to whom he recited the wisdom of the sayings of Al-Habib Ahmad bin Hassan Al-Attas, so that he could reap the Barakah of the great Imam. He also studied, in the city of Sayun (Hadhramaut), the scholarly work Zubad al-Itiqan fi Ulum al-Quran by the well-known Imam Jalaluddin al-Suyuti. These are only a sample of the many shaykhs from whose works Habib Abdel-Qadir benefited. Habib Abdel-Qadir studied for six years in the college (rubat) that was founded by his father in Aynat. This college produced a great number of scholars. It suffices to mention only two: Habib Muhammad bin Abdel-Qadir Al-Hamid, and Habib Ahmad bin Abdallah Al-Hamid. His pious sons also followed the footsteps of their late father seeking the sacred knowledge: Zayn, Haydar and also his grandson Hamza, currently a student at the famous Dar Al-Mustafa College in Tarim. His mother, Hababah Khadijah bint Ali bin Hassan Al-Hamid, wanted Habib Abdel-Qadir to move from Hadhramaut and live in either India or Indonesia, or on the Eastern Coast of Africa. But she told him that the permission to travel would come from Al-Habib Alawi bin Abdallah bin Shihab (one of Hadhramaut's greatest shaykhs). This indicates the strong spiritual ties between the pious lady, who excelled in the recitation of the Qur'an, with her tongue constantly heard in exaltation and remembrance of her Lord Allah, and the Imam bin Shihab. Habib Abdel-Qadir immediately went to see Al-Habib Alawi bin Shihab in Tarim. He found him at the mosque named Surur. After listening to Habib Abdel-Qadir and his reasons for wanting to emigrate, bin Shihab told him to go to the Swahili coast of Africa, recited Surat Al-Fatiha and prayed for his successes. Habib Abdel-Qadir started his journey in 1953 AD, or 1373 AH, from Tarim via Al Mukalla (the major sea port of Hadhramaut). From there he travelled to the Kenyan port city of Mombasa and stayed at the house of Shaykh Amer bin Nahyad Al-Nahdy. Later he met with the great Imam, the Qutb Al-Habib Ahmad Mashhur bin Taha Al-Haddad, who was already a resident in Mombasa, and stayed with him for three months. During this period he enjoyed religious love and wisdom from Al-Habib Ahmad Al-Haddad who raised him as one of his special children. After his stay in Mombasa was assured, Al-Habib Ahmad asked if he would prefer to engage in a trade or pursue the teaching of ilm (Islamic knowledge). He chose to teach in the footsteps of his upright grandfathers, the Ba'Alawi masters. This was the task undertaken by both of these great men of Allah. Al-Habib Ahmad was the interlocutor between the Mombasa residents and Habib Abdel-Qadir, so that a school should be established in which Habib Abdel-Qadir would teach. From Allah the Exalted and Merciful came the decision to build a school in the village of Kingorani, named "Madarasat Al-Huda Wa Al-Islam." A great number of Mombasa residents attended the opening, among them many Sayyids found in Mombasa at that time. Throughout this period Habib Abdel-Qadir received knowledge from Al-Habib Ahmad and from the learned Shaykh Ahmad Al-Laamy, also known as Shaykh Brayk. Jurisprudence was taught between Maghrib and Isha prayers, which were attended by a number of students. Habib Abdel-Qadir was well known for his noble manners. His heart was open, he was compassionate with people, he was generous and always brought good tidings. He was just and trustworthy, and the people loved him for his character, giving him the highest respect. On the Mombasa coast he was one of those steadfast and brave in the service of Islam, calling people to the straight path. Al-Habib Abdel-Qadir was one of the pillars of the path (tariqa) of Ahl Ba'Alawi in Kenya. The Madrasa he pioneered is now being led by his son Haydar, who has taken his father's place in all religious gatherings. May Allah bless him with good health and long life in his endeavours. Amin. 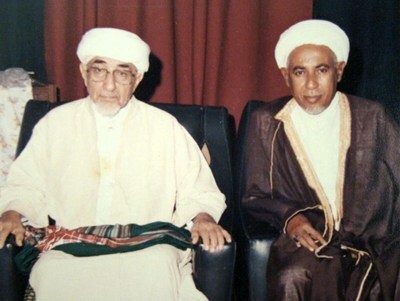 Al-Habib Abdel-Qadir was always in the company of Al-Habib Ahmad Mashhur Al-Haddad. During Habib Ahmad's stay in Mombasa for six months, he attended all the Majalis of the Burdha "Poem of the Mantle," an ode of praise for the Prophet Muhammad Peace and blessings be upon him. He completed the last 10 days of Ramadan, and after Al-Habib Ahmad Mashhur returned to Jeddah, Al-Habib Abdel-Qadir was the host for performance of the Burdha Majalis. After Al-Habib Ahmad Mashhur Al-Haddad passed away, leaving behind love among the people of Kenya, East Africa and the whole world, a love which remains alive in England, America, Canada, India, Pakistan, the Far East, and all other parts of Africa, Al-Habib Abdel-Qadir followed the example of Al-Habib Ahmad and the Burdha Majalis has increased with more people attending from all communities together since 1965. Habib Abdel-Qadir also used to ask Al Ustadh Al Allama Muhammad bin Sherif Al Beidh to explain the commentary of the Burdha. Sherif Taha Al Haddad joined Habib Abdel-Qadir during his discourses. Al-Habib Abdel-Qadir had great respect for Al-Habib Abdal Rahman (Sherif Khitamy Jamal Al-layl) and Sherif Mwenye Karama. Al-Habib Abdel-Qadir asked Sherif Muhdar to deliver a lecture on the history of great scholar, the Shaykh Al-Islam Abdurahman Al Saqqaf, at Masjid Mbaruk on the 23rd of Ramadan, with Al-Habib Sherif Mohammed Maaruf of Nakuru, Kenya. Al-Habib Abdel-Qadir also visited Nakuru in 1999 to attend the hauli of Shaykh Maaruf which Al-Habib Sherif Maaruf held on the last Sunday of Shabaan, for the last 35 years, in Nakuru. 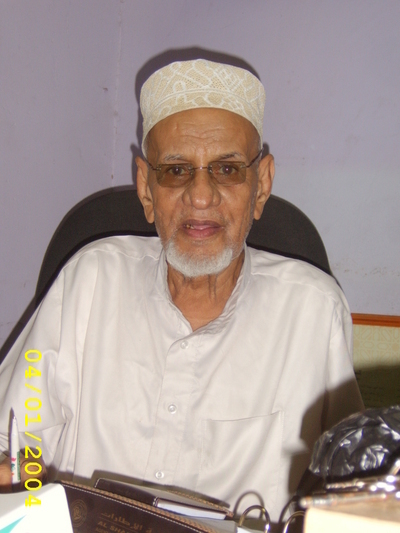 Since Al-Habib Abdel-Qadir arrived in Kenya in 1953, he attended Mawlid on 11th Rabi-ul-Awwal in Makadara Grounds, after Salat Al-Isha, and gave lectures in Arabic on various topics. Al-Habib Abdel-Qadir had great power in his speech and he performed many nikahs (Islamic weddings) at Muslim communities in Mombasa and all other places in Kenya. Al-Habib also attended, every Saturday, the Rawha at Sayyid Swaleh Al Hiyed in Guraya. During recent days he asked after everybody and was loved by all, and he also gave the name for the Madrassatul Faqih Al-Muqaddam to Sayyid Mohammed Mustafa Abunumey (Grandson of Al-Habib Ahmad Mashhur Al Haddad). The Majalis of Burdha every Thursday became so vast with so many people from all communities that Al-Habib Abdel-Qadir was given the title of Rais Ul Burdha. Al-Habib passed away on 13th May 2011, 9th Jamadil Akhir 1432. On Friday, 14th May 2011, 10th Jamadil Akhir 1432, at 1230pm, the Salat ul-Janaza took place at Masjid Shibu, Mwembe Tayari, Mombasa, Kenya. Al-Habib's Janaza prayer was performed by his son Sayyid Mustafa bin Sharif Abdel-Qadir. Al-Habib was laid to rest at Sarigoi Cemetery in Mombasa. The main roads were closed to enable a large crowd of people to attend the funeral, with dignitaries from the government. Before the Janaza prayers Qasida Burdha and Qasida Al-Mudariya were recited. Among those who attended the Janaza, many of the shaykhs' students had never witnessed such a large Janaza as that of Habib Abdel-Qadir. Three months before his death Al-Habib Abdel-Qadir gave his duties of performing Aqdi (Nikah) and direction of the madrasa to his son Hassan (Hayder) bin Sherif Abdel-Qadir. Duties were also given to Sayyid Hayder for Salu and all other matters. This took place at the residence of Shaykh Fadhil Abbas Jahadamy and in the presence of many shaykhs. Habib Hassan ibn Ahmed ibn Mashhur Al Haddad of the Comoros was present. Al-Habib Abdul-Qadir was trustee of Masjid Konzi, Masjid Shaykh Jundani and Masjid Shibu Alhamdullilah. The people of East Africa, England, America, Canada and all parts of the world who knew Al-Habib have lost a great Saint, a great scholar and a great Alim. The biography of Al-Habib was translated from Arabic to English by Shaykh Suleiman Salim Alawi, grandson of Shaykh Soliman Alawi of Zanzibar. Many thanks to Dr. Irfan Al-Alawi who suggested we should publish Al-Habib's biography. Dr. Irfan and his family are murids of Al-Habib Ahmad Mashhur Al Haddad. Shaykh Abubakr Bashuaib of England was saddened to hear of the passing away of Al-Habib Abdul Qadir. We all send our Fatiha, duas and blessing upon him.